Summary: Serpentine is a sweeping fantasy set in the ancient Kingdom of Xia and inspired by the rich history of Chinese mythology. 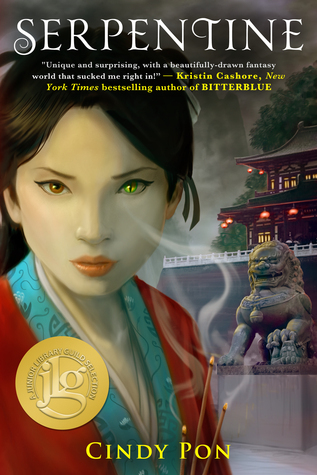 Review: It is a pleasure to relax into a world that I trust an author to handle, and I’m happy to report that my trust was rewarded with Cindy Pon’s Serpentine. One of my favorite things about fantasy is well-crafted worlds, and Pon paints the Kingdom of Xia vividly, from clothing to hairstyles to cultural norms and expectations. And of course, the mythology, with its demons and undead creatures and immortals and secrets. I can’t go too deeply into the my appreciation for the world-building without having to resort to spoilers, so I’ll simply say I wish more authors took as much care with making a world that felt lived-in. The little details can be just as important in setting a scene as the broader ones, and Pon did a fantastic job. Skybright is a wonderful protagonist who faces challenges both mundane and supernatural. Her struggles to figure out what was going on with herself and the supernatural world were equally compelling. I was particularly drawn to her friendship/sisterhood with Zhen Ni and how their bond was tested in a host of different ways throughout the story. Skybright and Zhen Ni’s relationship was easily my favorite in the book, especially in the second half, when things got rather complicated. I have a few minor complaints about the romance between Skybright and Kai Sen (mostly at how quickly it moved at the beginning), but it was mostly satisfying. I appreciated that Pon did not let their romance overshadow the bond between Skybright and Zhen Ni. Kai Sen was an interesting character, though I think a significant portion of that interest for me was in the potential for deadly conflict between him and Skybright. Once that was largely settled, my interest in Kai Sen waned. Stone was a character that I didn’t appreciate much at the outset, but he grew more intriguing as the story turned toward the greater supernatural conflict. I’m curious to see more of him even though I don’t particularly like him—his character has the potential to deepen the scope of the story in the next book. Recommendation: Get it soon! The fantasy world of Serpentine is well crafted. Cindy Pon has populated the world with interesting characters and a high-stakes plot that steadily ramps up to a solid climax. While there are a few points that didn’t work for me as much as I wanted them to, this was a satisfying read.